may take out some of the underpainting orange. forward awards are a lovely part of blogging. bloggers who make a difference in my artistic life. enjoy one another's work immensely. documents her process so we can learn. has one of the best laughs on the planet. hand to, and has painted a wide variety of subjects. didn't make me stare and stare to analyze it. in the time it takes me to set up my paints. high key colour exploration, and she is my friend. Blogger award, and I was delighted that she did. to stop at six and I could keep going all day. party. Let's think about that for next year! Labels: art award. friendship matters. great times in blogging. a party. You deserve this award, Barbara, and I wish you continued success in all of your art endeavors. There is no one online doing what you do and...your...work...is...fabulous! The icing on the cake is that you have a good heart that communicates joy every time you post. I'm honored to be on your list with the other wonderful women artists and I hope to live up to such a generous award. Thank you Barbara! You are the quintessential "friend and sister of sharing and caring". We all need more people like you in our lives!! It's a privilege to receive this award from you! and you deserve it big time. I think there are a lot of people on line doing what I do. You do for instance, but thanks anyway, I love your praise. I'm honoured to be your friend. It's a privilege to know you. There have been many times in the past year when a kind comment from you made me feel a warmth and joy that made everything all right. Thank you. Thank you. Barbara, you ARE the champion of all four of those qualities. It's no wonder this came your way--your positive light shines in every post, and each time I get a comment from you, I'm sustained and happy. Everyone needs someone like you in their life! Thank you so very much for including me in this great group! 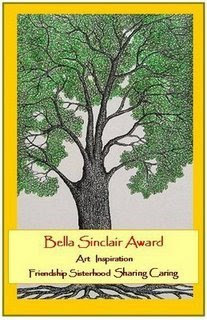 You embody the spirit of this award, Barbara, and the best ethos of blogging with your friendship and kindness. Thank you for including me in this wonderful company; I'm flattered, and encouraged! I feel the exact same way about you. Your comments are a delight, your work is beautiful, and you are a positive force in my artistic life. company where wonderful artists gather. I love your work and your blogs so much. I feel like I almost got a second English degree this spring reading the poetry you included. Thanks for your kindness. Sorry for the late reply, Barbara, but unfortunately I have been on the go for three days now and didn't have time to do so earlier. Nevertheless a big THANK YOU for including me on your list of award winners, of wonderful women and artists! It is an honour for me and I am very proud. Actually I would like to simply quote what you said to Laurel - that's exactly how I feel about you! I am happy to have met you online and am determined to meet you in real one day! Thank you! And I feel the same way about you. I will be in Europe in December and highly tempted to make the trip from Florence to you, although I gather that's about as far as from Toronto to Halifax, a bit of a drive. Congratulations on the award. One most deserved no doubt. I'm really diggin the little landscapes. Thanks so much, they've been fun to do. You know I'd give you an award too in an instant, but this one was strictly for women. Congratulations on receiving the award, and thank you sweet friend for offering it to me. I'm inspired by you daily. Thank you Barbara...you are truly a wonderful person! approach the canvas, and when I get time to watch your videos I learn so much. And you are a truly wonderful person. I'm glad you're getting a new studio. I'll continue to work with my sun yellow walls, and floor covered with green tape with the sitters' names. I keep promising myself to take the old tape off, but I'm sometimes intrigued by the shape of a model's feet on the floor, like part of a dance step that's history now. Okay you've persuaded me, I'm getting out the rubbing alcohol and cleaning up the floor.